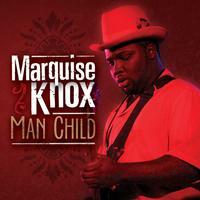 Man Child is the title of Marquise Knox's national debut, and for good reason. Yes, he was just 16 years old at this recording, but no, this is not another one of those guitar-hero, someday-my-vocals-may-mature, I-might-one-day-write-my-own-material records. This kid is flat-out for real! This is a man-sized offering of serious, mature blues. In fact, it's the maturity that provides the shock value here. Sixteen years old?! Listen to that voice and you'll swear he's lying about his age. Guitar licks that are tasty and restrained, none of this hyper-active, self-absorbed speed metal that somehow gets confused with blues. Marquise has already won the approval of B.B. King, Henry Townsend, Robert Lockwood Jr., Big George Brock, Bob Margolin, Sam Lay…Read those names again. Do you really think we're talking about a novelty act here? And he's an original. All but one of the tracks on Man Child were penned by Marquise, and most of them were written in the studio, on-the-fly, a skill learned at least partially by one of Marquise's main heroes, Henry Townsend. This is a 16-year-old, inner-city kid who somehow has decided to become a dead-serious bluesman of the old-school variety. That just doesn't happen anymore. Clear the way for the Man Child. The music on this LP is just the best, this young man was 16 when this was recorded? I am so blown away, and then we are talking about the acoustics in that church in Kansas that Chad has converted to a performance and recording venue, it is grand. This disk plays perfectly, and the sound, the energy of the venue just charges my sound room when I play this LP. I have blown multiple gatherings away with this LP, no one ever buys it when I tell them Mr. Knox is 16 years old, then I pass around the LP cover and you should see the faces... It is great fun! Great LP, Great performance.